A Happy Heart Warm them and cuddle them for the way to A Happy Heart is the gift of love. 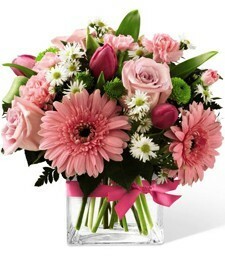 Send the most cherished hugs and kisses to that special someone with a perfect array of hot pink and invigorating green blossoms to indulge into the world of unconditional affections. 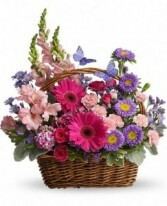 Send wishes for a very happy birthday with this fun bouquet. 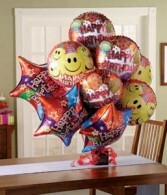 Filled with Birthday mylar balloons and a delicious box of chocolate wrapped in bright red ribbons, this bouquet will certainly make their birthday unforgettable! Replenish spirits with a gorgeous breath of fresh air! 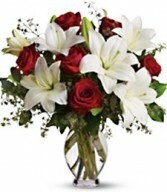 Beautifully arranged with lovely roses, lilies, and greens, this bouquet truly adds an aura of peace and harmony to the room.